I’ve long had a love-affair with the 1930-40s pulp magazines. The Shadow, Doc Savage, The Black Bat in Black Book Detective, Moon Man, The Spider among many others. While you’ll find few literary gems among them, they were high-energy, high-octane thrill rides that supplemented radio and movies as major American entertainment. The Black Claw was my tribute to those old, forgotten pulps. I began noodling around with the character in the mid-90s, finishing the second volume sometime around 1998. The first volume was completed after the second. I’m not sure why, but that was how it worked out. The first book begins in April 1942, shortly after Pearl Harbor and at a time the American military was still floundering to get the war effort in gear. The second one picks up a few months after the first. I had 10 volumes mapped out that would take the heroine of the story — that’s right, the Black Claw is a chick — to the end of World War II. The Challenge of the Black Claw was to be the third title. I have it partially written and fairly well mapped out. The fourth through tenth volumes included Shadow of the Black Claw, Death of the Black Claw, Ghost of the Black Claw, Return of the Black Claw, Blood of the Black Claw, Sign of the Black Claw, and Triumph of the Black Claw, which would take the characters to August 1945. The first books resided in my computer for years. When I retired and decided to publish ebooks, I dusted them off and put them in The Kindle Store. This last summer I placed a full-page, color ad in The Pulpster, the official program of PulpFest, a huge convention held annually in Columbus, Ohio. If I were to say the ad generated as much interest as watching grass grow, I’d be exaggerating. 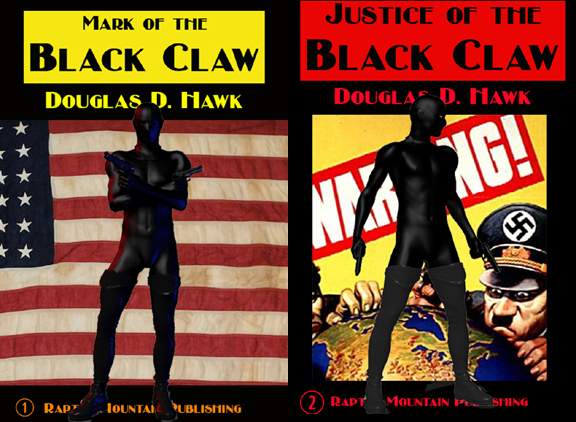 Thus, I’m going to keep Mark of the Black Claw and Justice of the Black Claw available for now; however I won’t be adding any new tales. CLICK HERE for Justice of the Black Claw also only $.99.